Question of Method in Cultural Studies brings together a group of scholars from across the social sciences and humanities to consider one of the most vexing issues confronting the proverbial 'anti-discipline' of cultural studies. Probes the possibility of method in explicit terms for scholars and students in media, communications, sociology and allied fields. Mimi White is Professor of Radio/TV/Film at Northwestern University. She is author of Tele-Advising: Therapeutic Discourse in American Television (1992) and co-author of Media Knowledge (with James Schwoch and Susan Reilly, 1992). James Schwoch holds a permanent faculty appointment at Northwestern University, where he conducts research on media history, diplomacy and international relations, science and technology studies, and research methodologies. He is the author of The American Radio Industry and Its Latin American Activities, 1900–1939 (1990). 1. 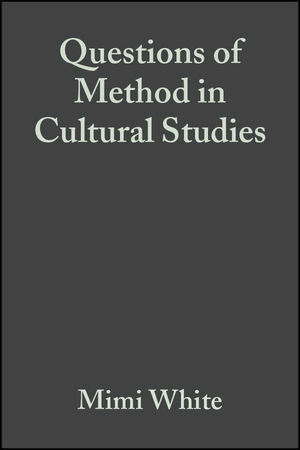 Introduction: The Questions of Method in Cultural Studies. (James Schwoch and Mimi White). 2. From the Ordinary to the Concrete: Cultural Studies and the Politics of Scale. (Anna McCarthy)3. Raymond Williams’ Culture and Society as Research Method. (John Durham Peters). 4. “Read thy self.” Text, Audience, and Method in Cultural Studies. (John Hartley). Part II: Production and Reception: The Politics of Knowledge. 5. Cultural Studies of Media Production: Critical Industrial Practice. (John Caldwell). 6. Feminism and the Politics of Method. (Joke Hermes). 7. Taking Audience Research into the Age of New Media: Old Problems and New Challenges. (Andrea Press and Sonia Livingstone). Part III: Cultural Studies and Selected Disciplines: Anthropology, Sociology, Ethnomusicology, Popular Music Studies. 8. Mixed and Rigorous Cultural Studies Methodology--an Oxymoron? (Micaela di Leonardo). 9. Is Globalization Undermining the Sacred Principles of Modernity? (Pertti Alasuutari). 10. Engagement through Alienation: Parallels of Paradox in World Music and Tourism in Sarawak, Malaysia. (Gini Gorlinski)11. For the Record: Interdisciplinarity, Cultural Studies and the Search for Method in Popular Music Studies. (Tim Anderson).